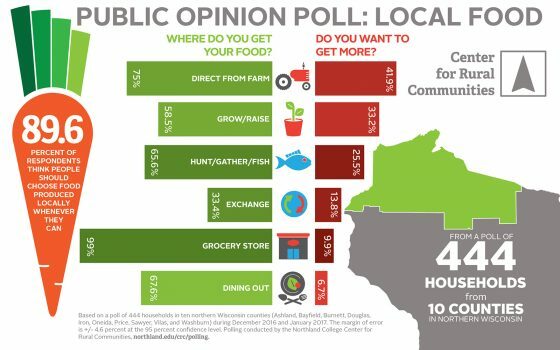 The majority of households in northern Wisconsin get their food from a diversity of sources and purchase food directly from farmers, according to the most recent Northland College Public Opinion Poll. “The results show a northern culture of supporting local farms, sharing, producing, and gathering food—and an overwhelming 89.6 percent think people should choose food produced locally whenever possible,” said Brandon Hofstedt, faculty director of the Center for Rural Communities. The Northland College Center for Rural Communities (CRC) conducted a poll of residents in the ten northernmost Wisconsin counties between December 2016 and January 2017. Pollsters asked 444 participants questions about where and how they get their food, how much of their food comes from those sources, from where they would like to get more food, and their general attitudes and values toward food. More than two-thirds of respondents—68.3 percent—identified feeding their families from four or more different food sources. “In other words, we have a regional food system that has the potential for weathering economic or environmental impacts—something referred to as resilience,” Hofstedt said. Not surprisingly, stores are the most common and the largest source of food—some 77 percent stated they get most of their food from stores. What is interesting is where people get the rest of their food. “While a poll like this has not been done in other places, I strongly suspect that getting food locally in these ways is a distinct north woods quality,” Hofstedt said. Seventy-five percent of participants get food directly from farmers—on the farm, off-farm food stands, through community supported agriculture (CSA), farmer’s markets, or pick your own. Some 65.6 percent get food by hunting, fishing, or gathering—ricing, tapping trees, gathering forest fruits, vegetables, and nuts. Some 58.5 percent grow fruits or vegetables, or raise animals for meat or products. And 33.4 percent get food by sharing, exchanging, or by donation. Overall, 77.2 percent of all participants agreed public lands should be not sold. In addition to prioritizing local food, nearly all households share healthy food values—that people have a right to know what’s in their food and that health is one of the most important factors for their household when making food choices. The data not only indicate recognition of the importance of local foods but opportunity as well. Nearly 42 percent said they would like to get more of their food from farmers. “The hunger for local food does not seem to be satiated,” said Matt O’Laughlin, research associate at the Center for Rural Communities. The poll identified the reasons households don’t buy more food directly from farms—seasonal limitations (41 percent), not knowing a farmer or where to find a farm (38.5 percent), too far away (26.7 percent), and not having time (25.4 percent). A summary of results can be viewed at northland.edu/polling. The margin of error is +/-4.6 percent at the 95 percent confidence level. Founded in January of 2015, the CRC applies research-based solutions to social and economic challenges, partners with community members to build on local knowledge, and promotes the long-term health and vitality of rural communities in the north woods region.